Do you have gunk and build up on your iron? I know I do from time to time; especially when I work on a t-shirt quilt. Tricot interfacing, unless you use a pressing cloth, will leave a residue on our iron and so will "batting tape" (which is nothing more than tricot interfacing cut into strips). I've purchased iron cleaning pastes and one in particular works pretty good. 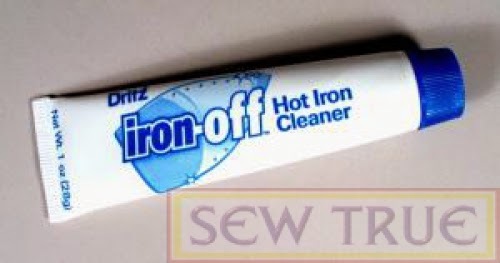 It's not extrememly pricey; around $4-5 per tube but if your iron is really yucky, it's not hard to use most, if not all of the tube in one cleaning. Then a friend in Guild shared this blog post with all of us. I love "homemade" rememdies. They are so much cheaper. A whole box of baking soda is less than a $1. And it works! She also shared how to clean the inside of your iron too. Now why didn't I think of this? I knew you used vinegar to clean the inside of a coffee maker, even though I'm not a coffee drinker. Of course it would work the same with an iron. So, go get your iron, some baking soda, vinegar, and get to cleaning. I want to see bright, shiny clean irons!